A goldsmith discovers the art of distillation. Ma fantastico! Benvenuto Cellini, a goldsmith and sculptor in Florence in the 16th century discovered the art of distillation during one long stay in Venice. Forgetting all about his profession as a sculptor he began the craft of distillation. 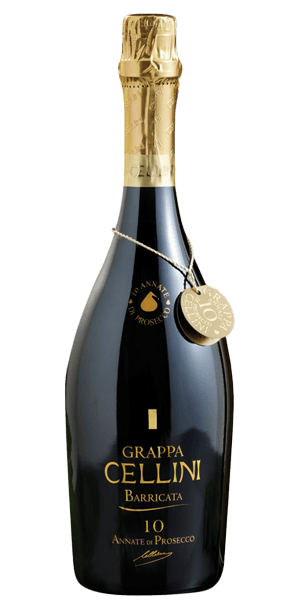 Grappa Cellini 10 Annate is distilled from Glera, a rather neutral white variety of grape of Italian origin, which until 2009 was mostly referred to as Prosecco. It is made from a selection of aged Grappa produced with the grapes of ten different harvests. They’re distilled according to the Sandro Bottega method, which means the Grappa is left to mature for quite a long time. What does Grappa Cellini 10 Annate taste like? The Flavor Spiral™ shows the most common flavors that you'll taste in Grappa Cellini 10 Annate and gives you a chance to have a taste of it before actually tasting it. Italians add Grappa to espresso coffee to create a caffè corretto, meaning "corrected coffee". Incredibile. Smooth and full bodied, with scents of spices and smoked wood.